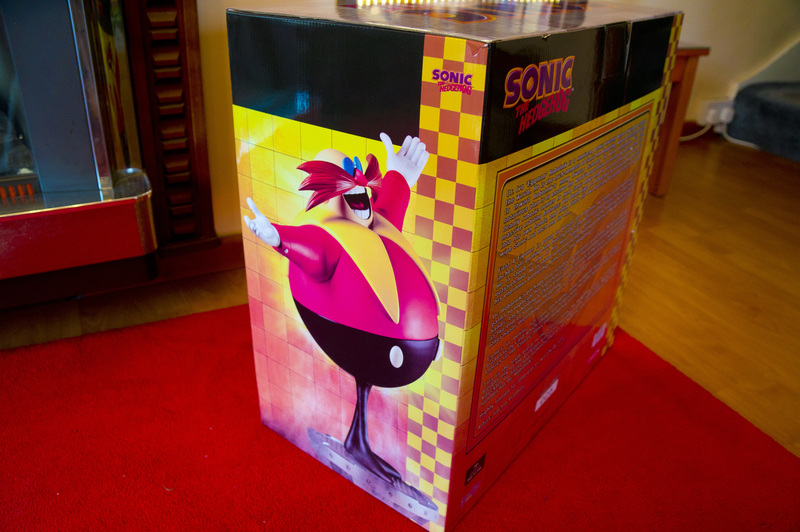 Giant Sonic Statue Found In The Woods of Japan! 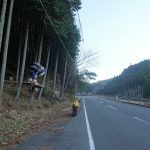 At the end of 2015, twitter user and bike enthusiast 250moriyuki wanted to test out his new bike around some of the more remote parts of Japan, on his journey he documented the trip and posted a number of images showcasing the sights on his adventures. 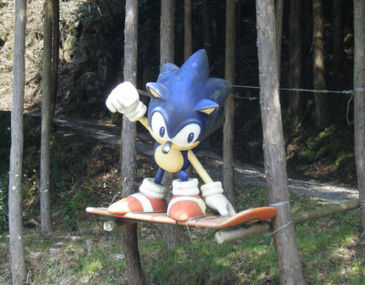 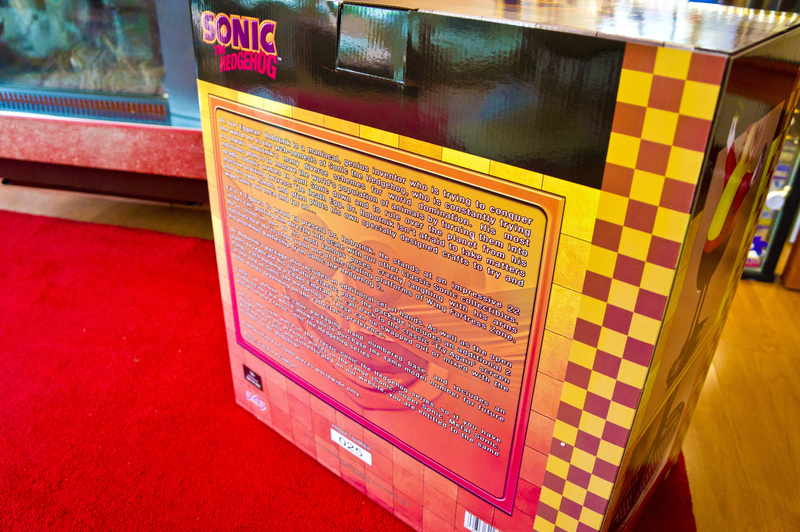 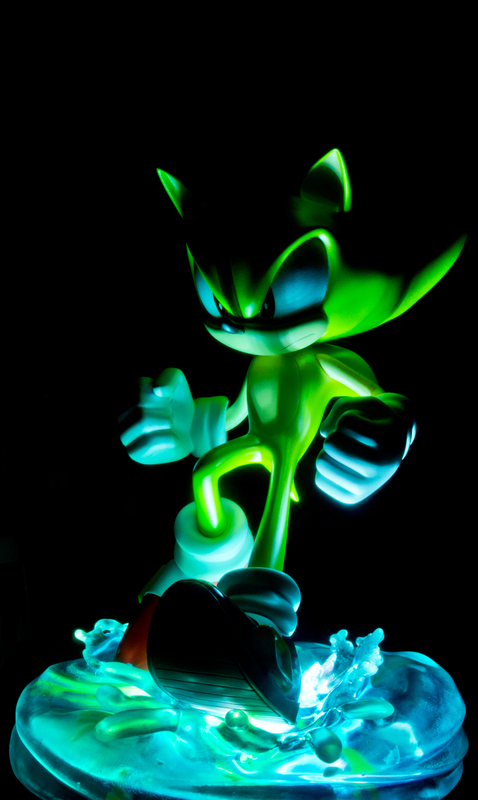 One of three images showing a giant Sonic statue, standing on what appears to be a snowboard held in place against two trees. 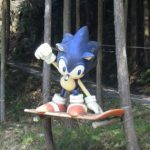 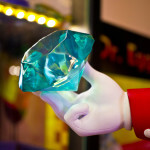 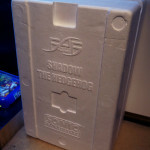 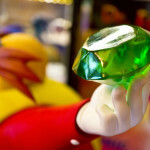 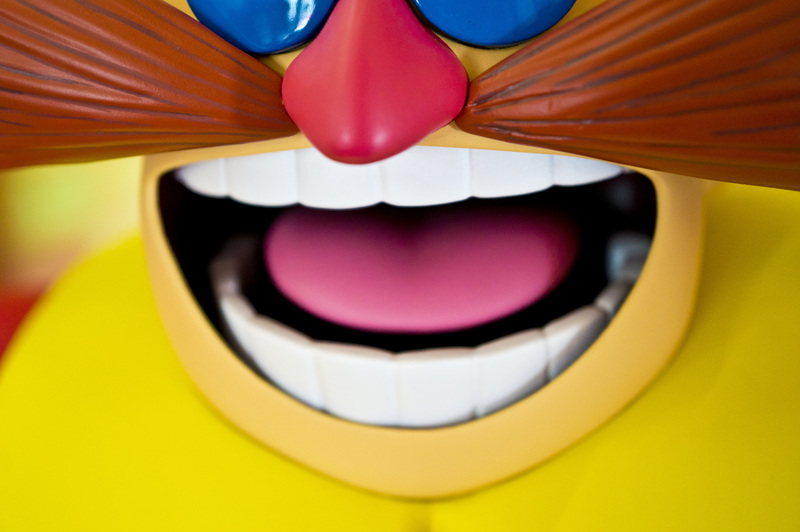 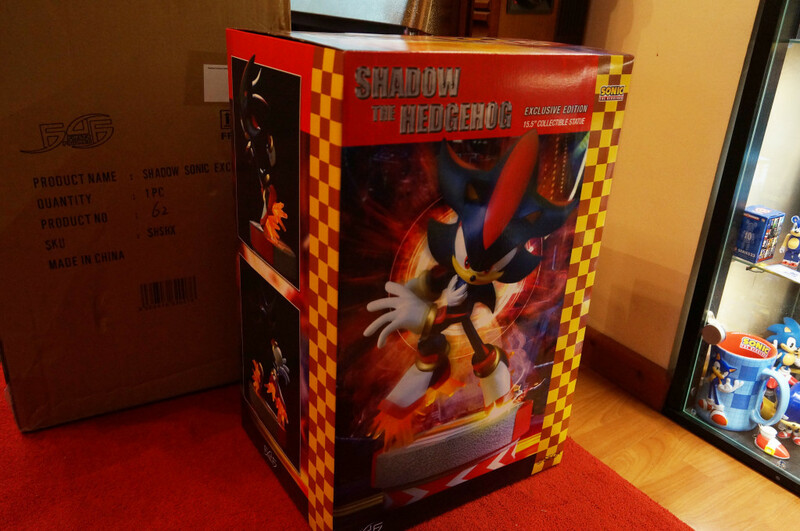 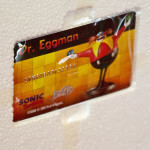 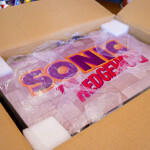 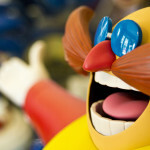 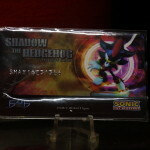 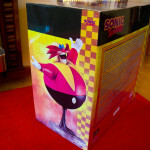 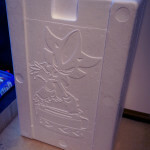 Only a handful of Sonic fans had seen this, at the time only a single blog entry showing a low quality image of it existed online which again didn’t give an exact location. 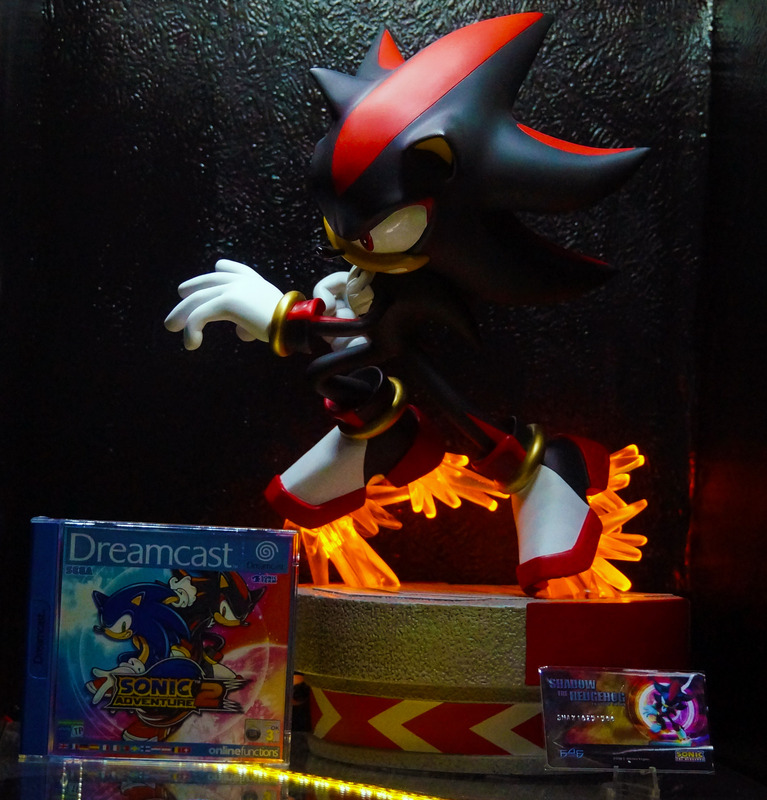 Given the lack of information and the significance of the find, many users on our forums including myself attempted to find the statue. 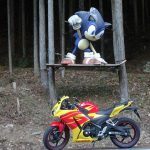 We knew that it was in the Mie Prefecture and on the day moriyuki posted his original images, he mentioned the Soni Village, so we knew the rough area it was in. 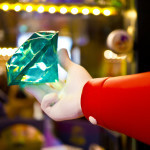 However, despite efforts to pin point the location, that region is huge, with hundreds of roads, it was going to take a long time to find searching manually. 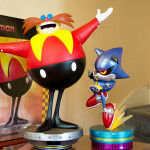 Since then, other images of the statue have surface, but again, no location posted. 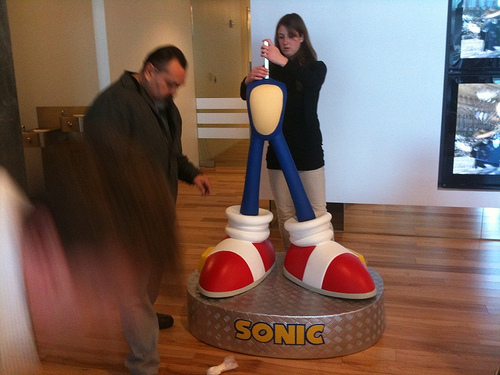 SSMB user BxB-Meister posted a single image from what appears to be a google street view search showing the statue! 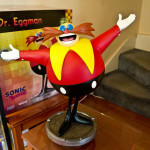 Following a conversation with BxB, he agreed to give me the exact address of the statue on one condition. 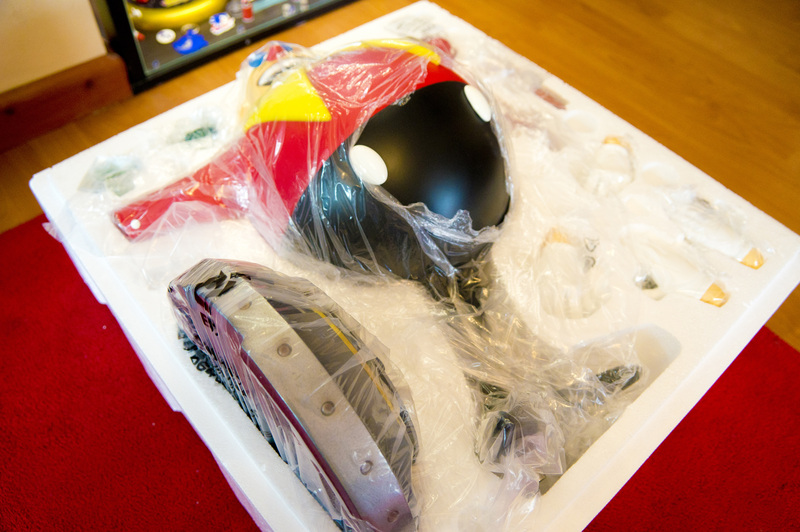 That condition is to keep the exact location a secret for now. 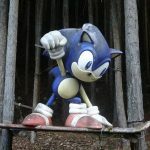 The reason being is that the statue is in a very remote location and people are worried that once the location is fully revealed, the statue’s days are numbered, there is a risk of vandalism or even theft. 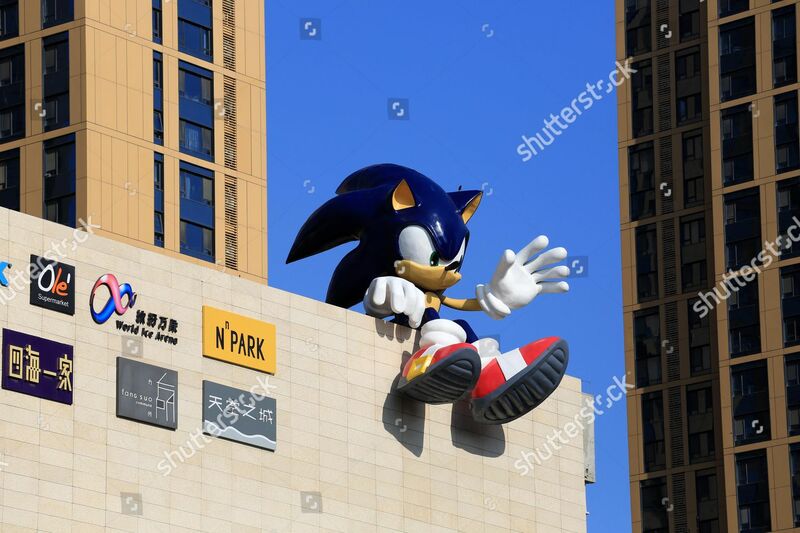 Until someone can go out there, and document this statue with the intention of taking high quality photographs and even video, it’s exact location should be kept secret. Now that said, I will gladly give out the location of the statue if someone is able to go out there and document it. 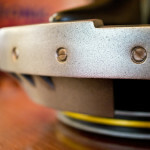 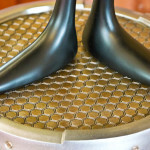 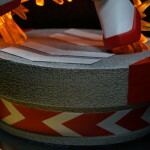 So here is the only hint as to where it is. 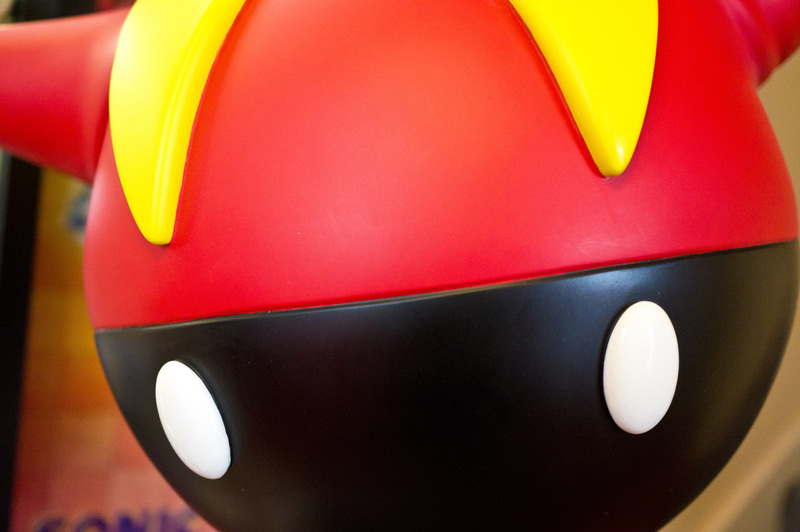 By car, it’s between 15-30min away from the Kindai University Technical College located in Nabari. 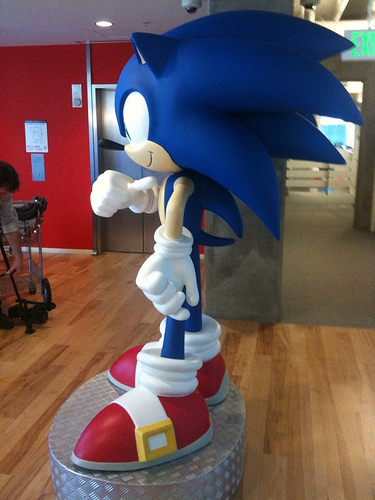 So if you are capable of getting to that location, it should be very easy (even by foot) to get to the statue. 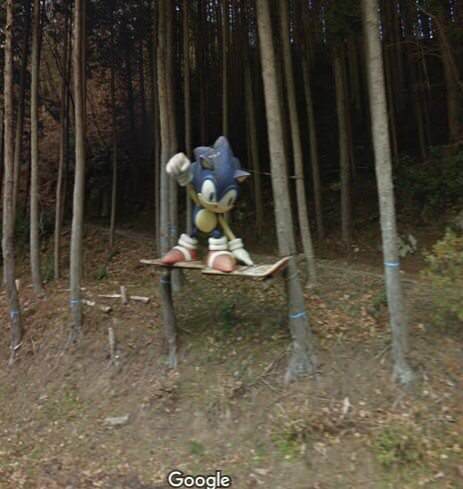 If you do happen to live in Japan can get to this area and are willing to go on an adventure, contact me via the SSMB forums and I will give you the address if you be worthy! 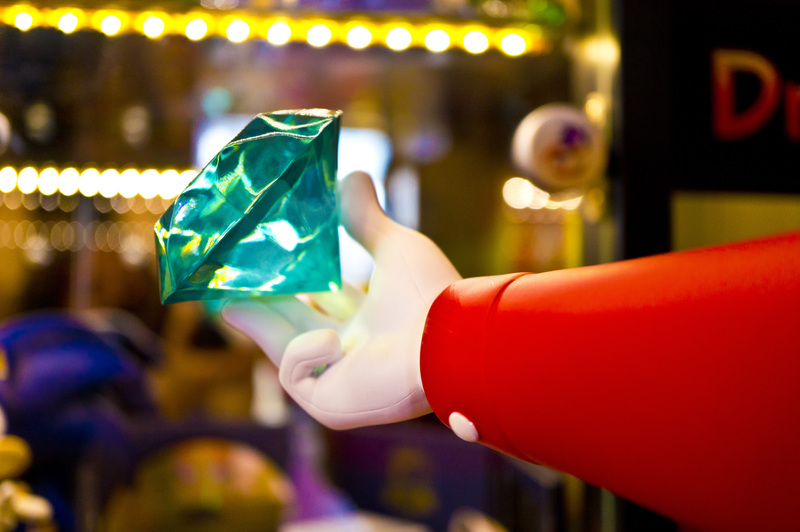 Yup, I’m treating this exactly like a quest, because let’s be honest! 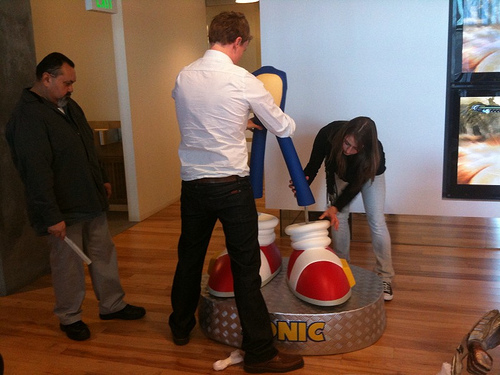 This is as close to an RPG quest as we’re going to get! 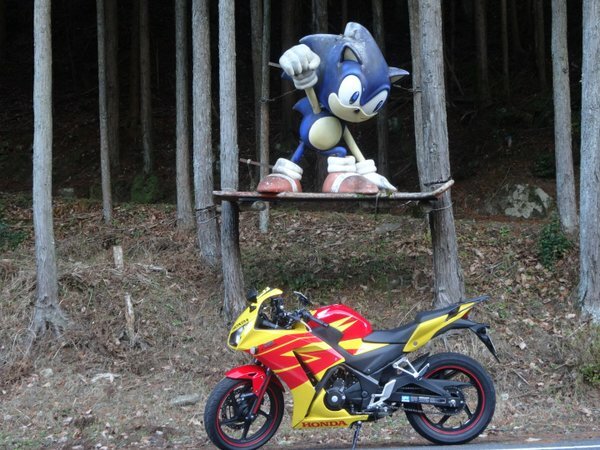 So until the day comes where someone fully documents this statue, let’s hope it has many years ahead of it as it cheers on riders and other adventures! 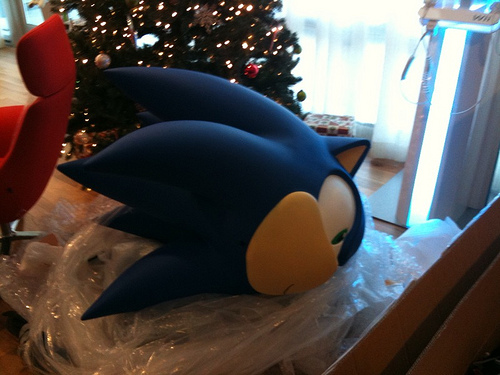 Although, as one mystery ends, the other remains. 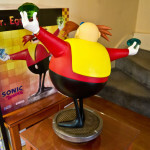 Just why is this statue there? 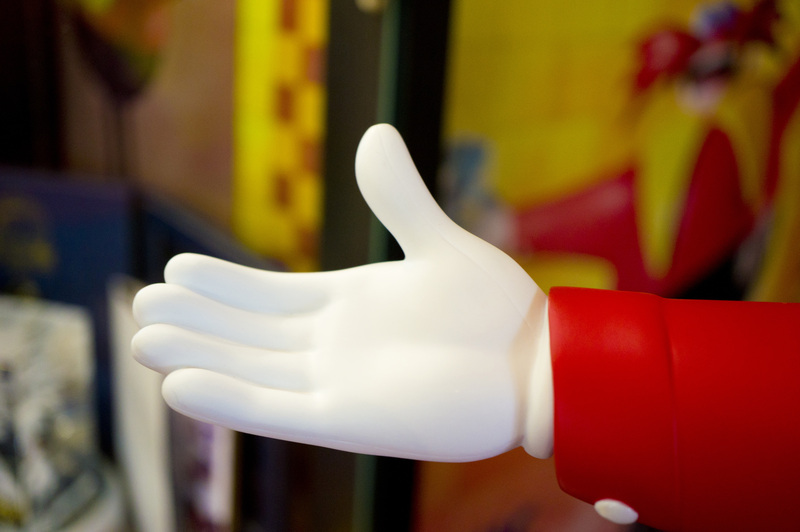 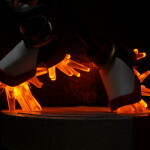 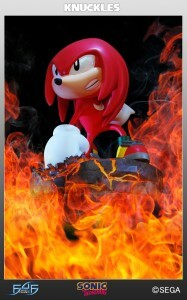 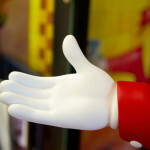 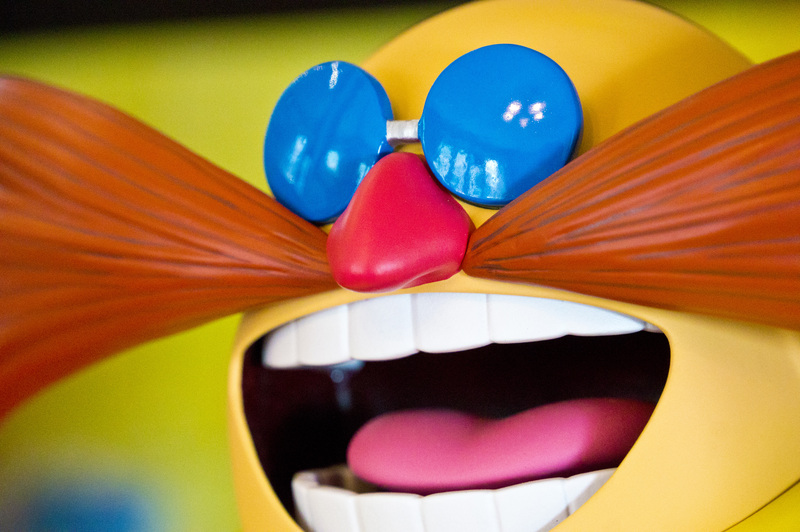 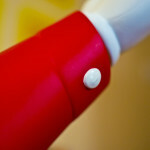 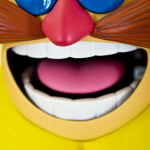 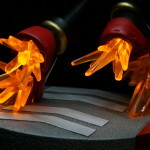 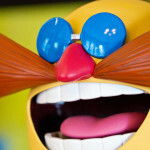 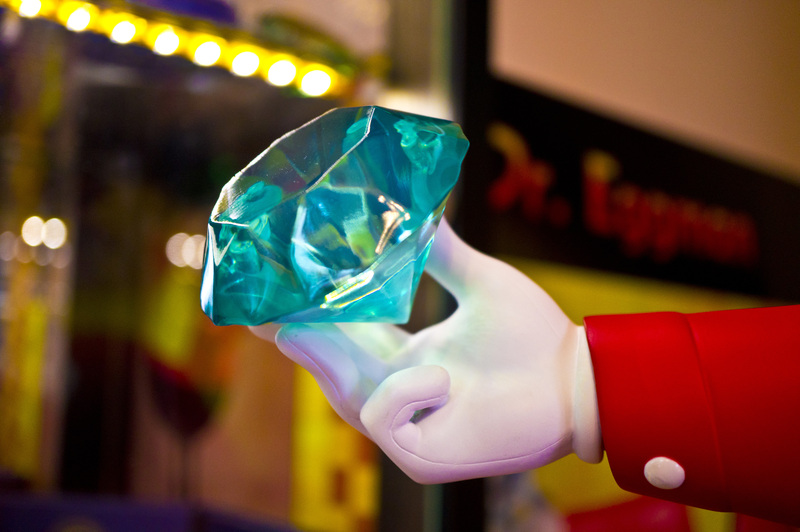 First 4 Figures has today opened pre-orders for their recently teased Classic Knuckles statue. 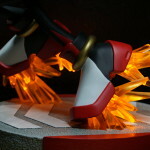 An ‘Exclusive’ version has also been revealed, which features red and yellow lights to give a lava effect to the rocky base themed around Sonic & Knuckles‘ Lava Reef Zone. 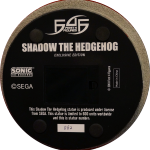 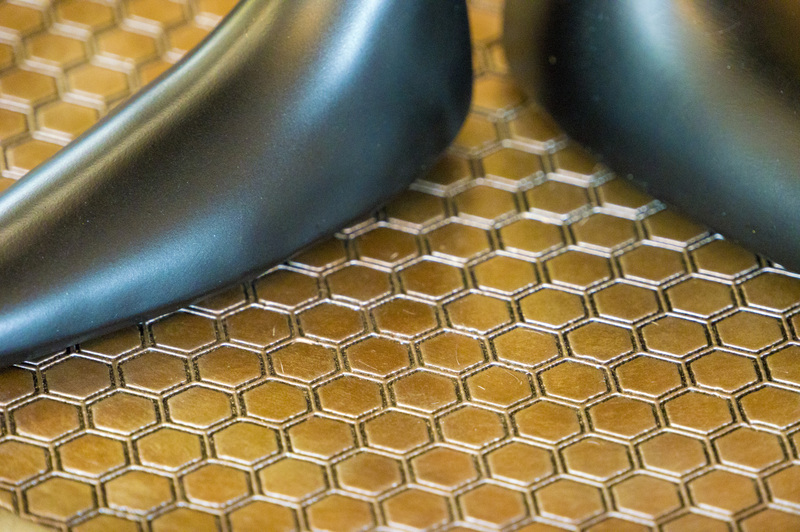 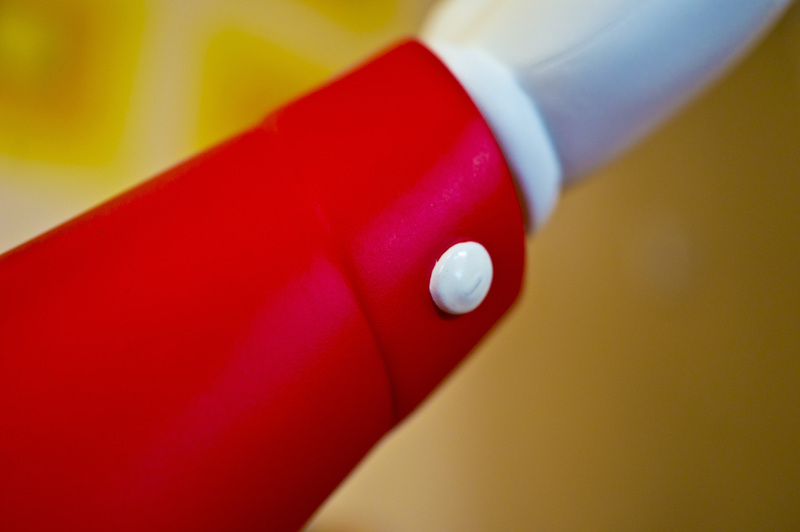 The Exclusive version will set you back $189.99 and is limited to just 500 pcs, while the standard version (without lights) will cost you a little less at $169.99 and will be limited to 1,500 pcs. 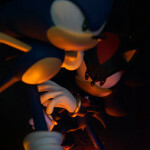 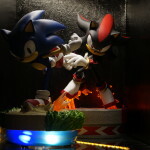 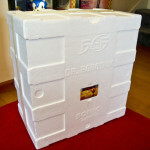 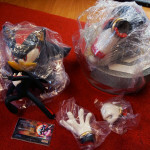 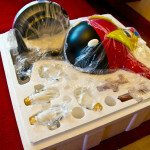 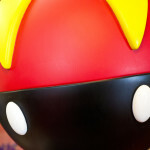 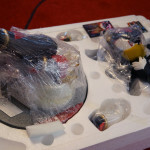 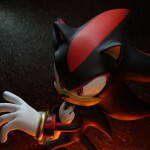 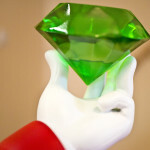 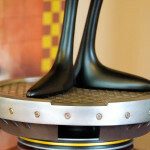 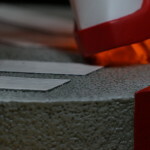 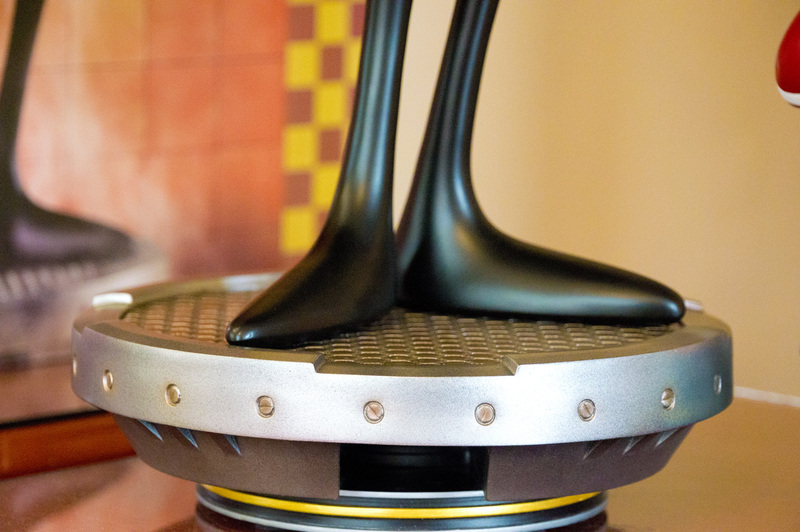 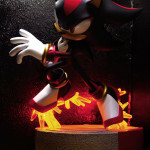 Both statues will be released Q2 2012. 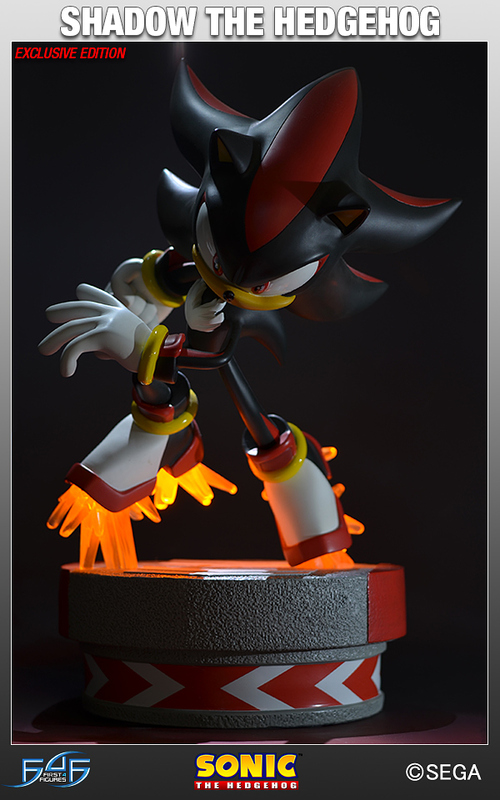 You can pre-order and view more images of the statues at the links below. 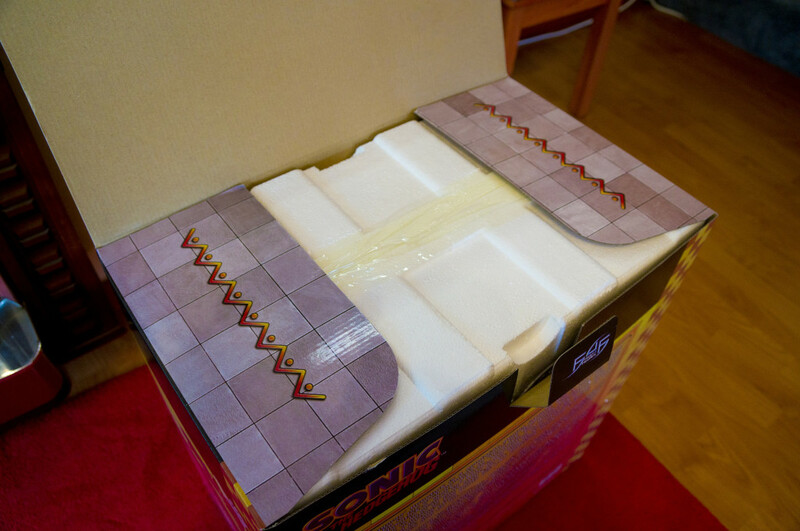 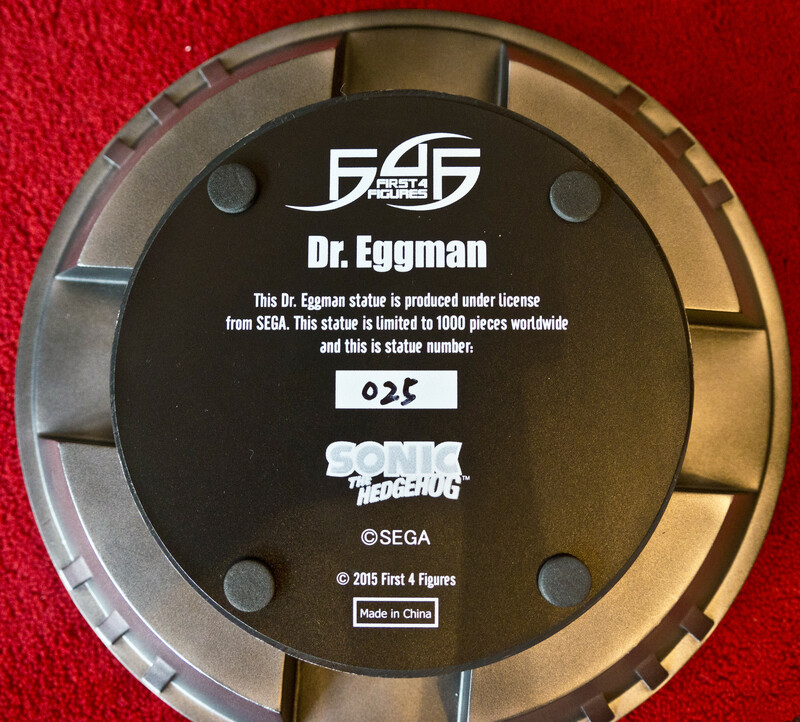 Thanks to sonicwalter via Twitter for the heads up! 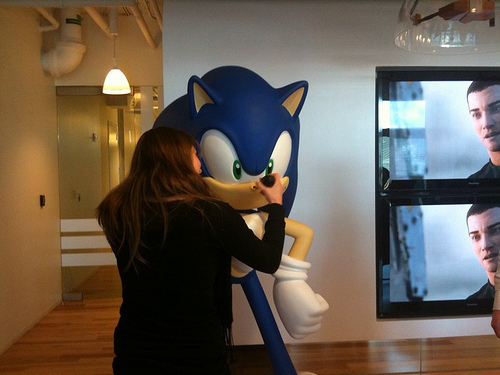 So I’m just sitting at my desk, typing away, when one of our HR reps appears over the wall of my cube. 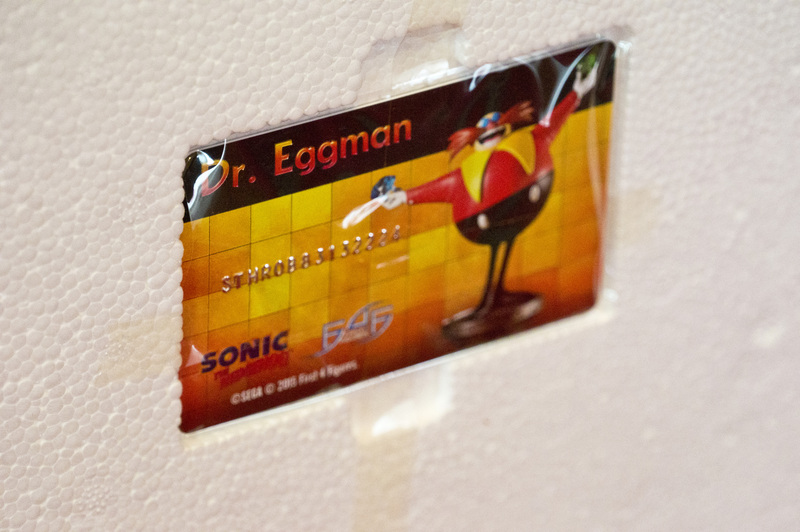 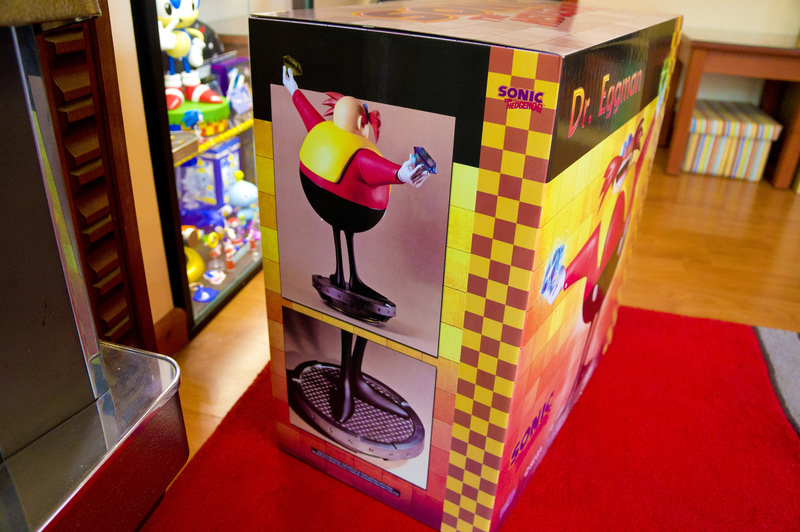 She says there’s a new Sonic in the lobby, and I should bring my camera. 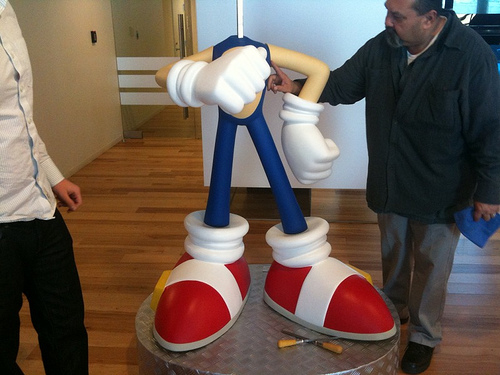 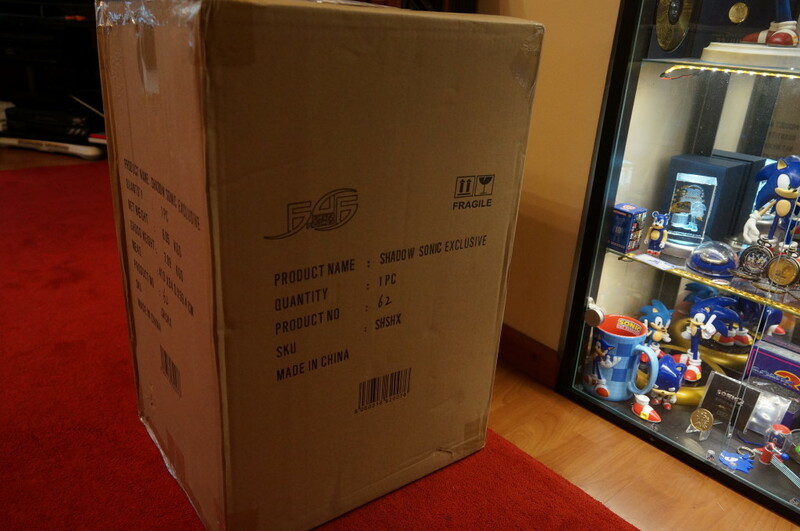 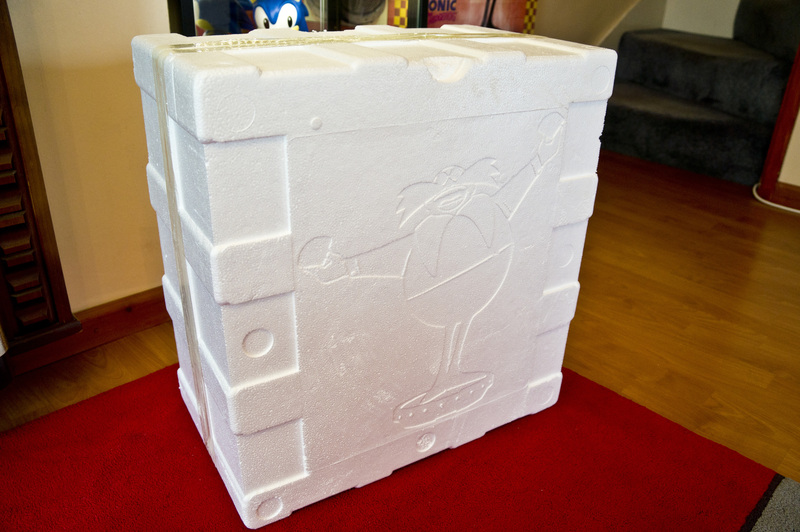 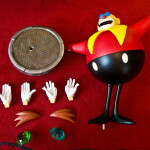 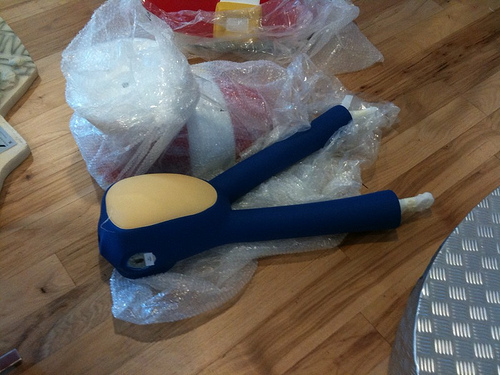 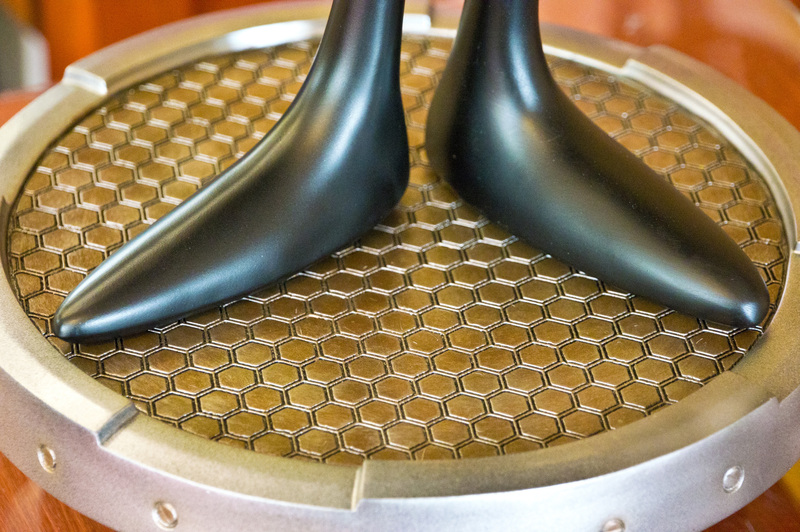 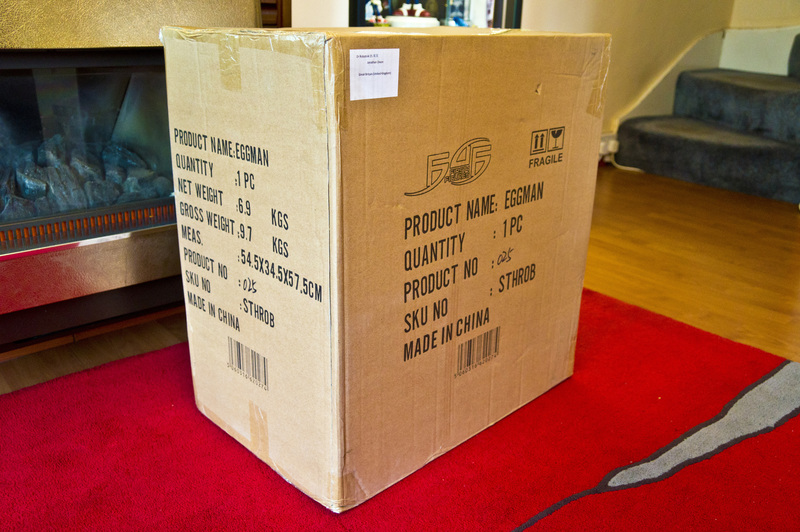 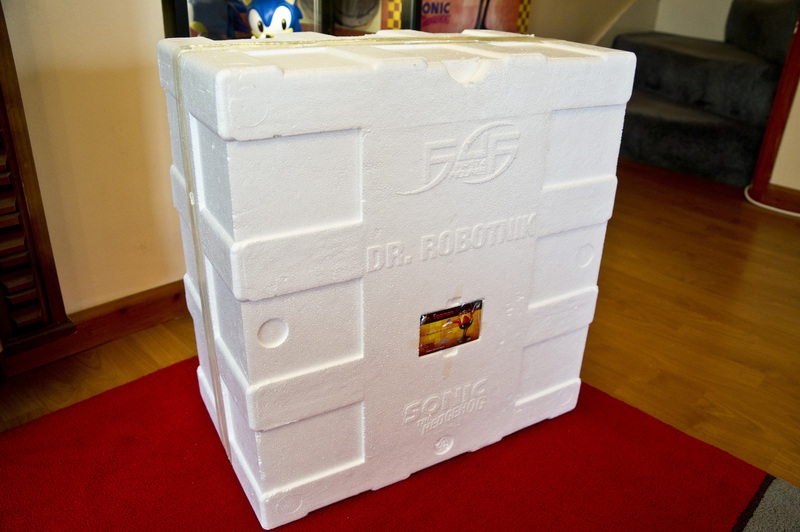 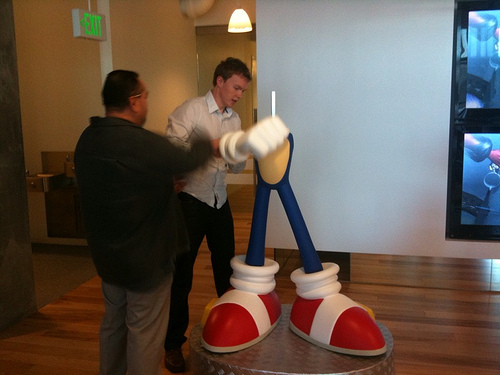 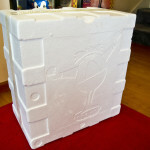 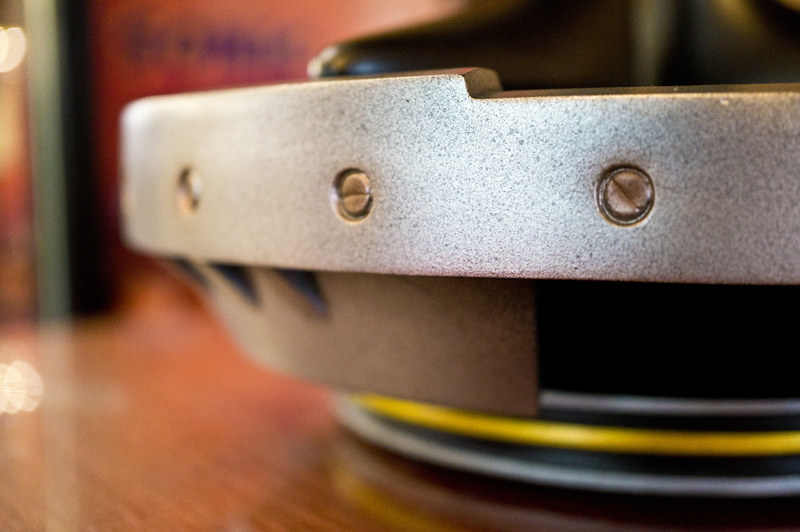 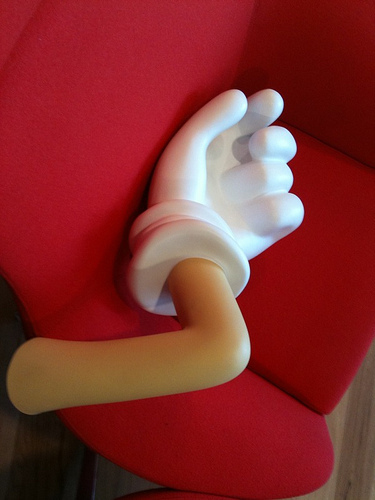 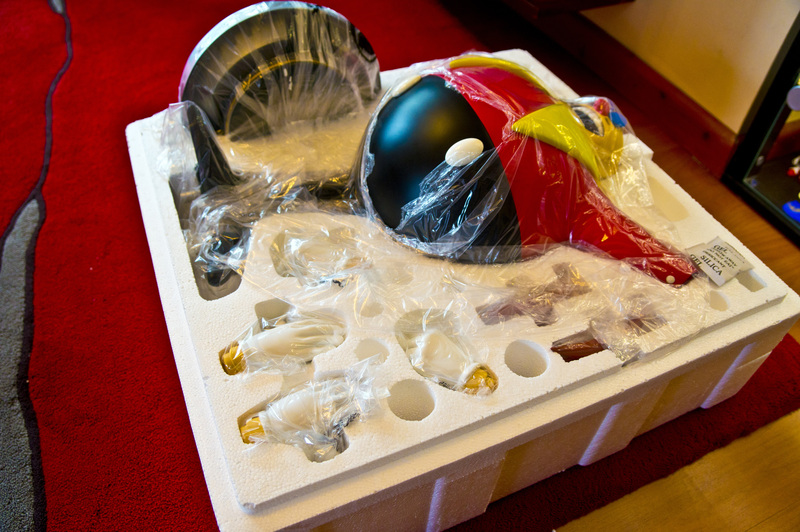 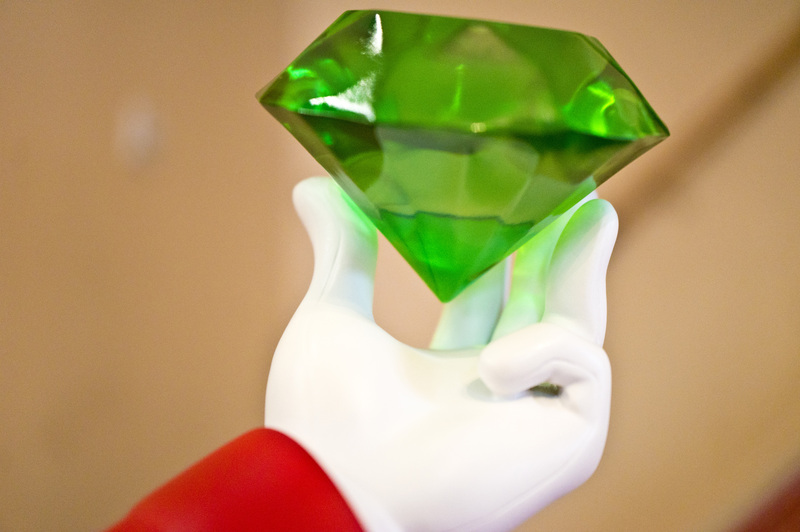 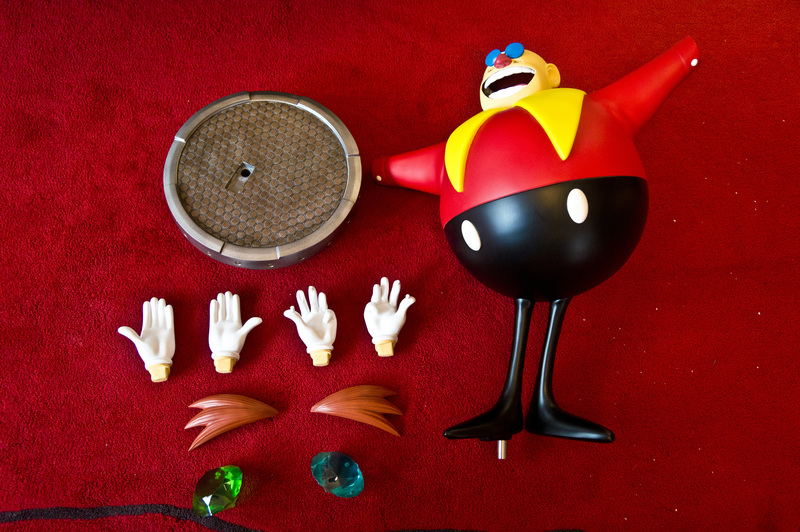 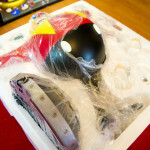 I dash off to find a major project in the works — the assembly of a new Sonic statue. 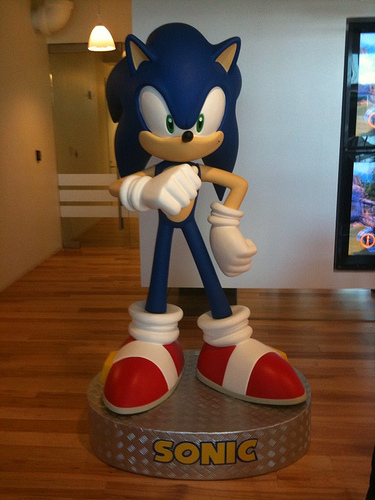 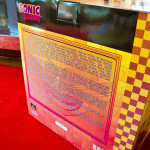 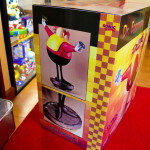 In case you’ve never been to our offices (as I assume most of you have not), we have a Sonic in our lobby. 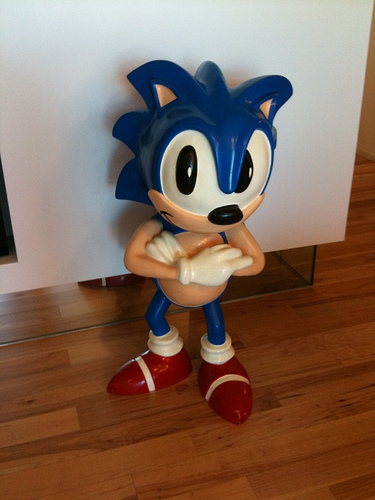 It’s the older ‘99-ish Sonic. 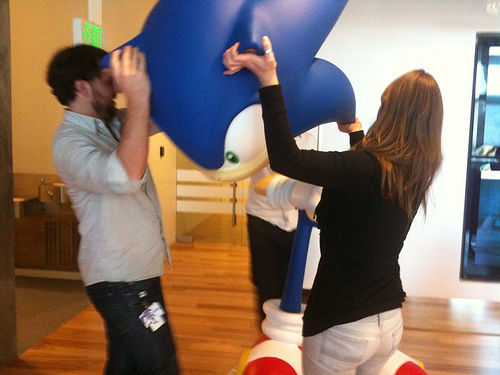 He comes up to my mid-torso — tall enough for me to rest my elbow on. 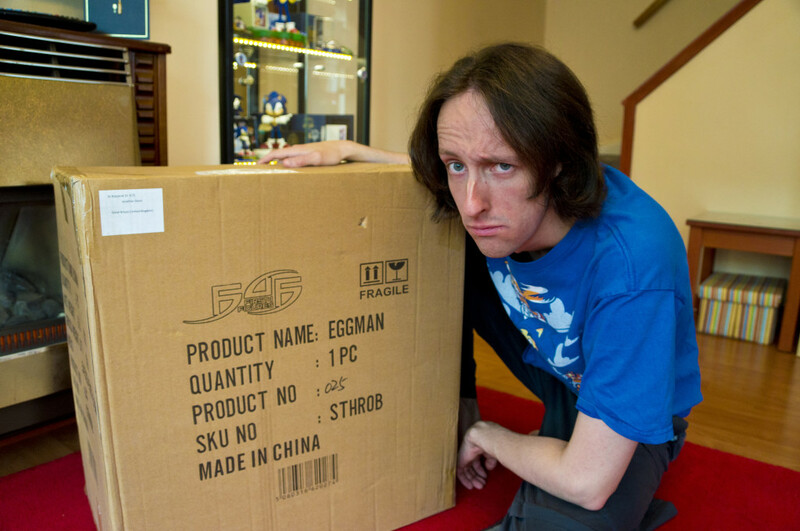 Sadly, the answer is none of the above. 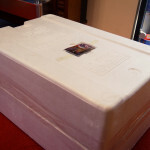 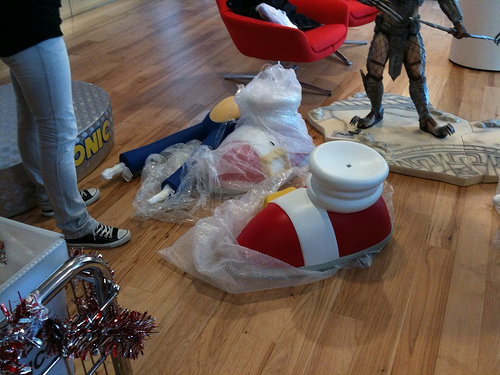 The old Sonic will go into storage. 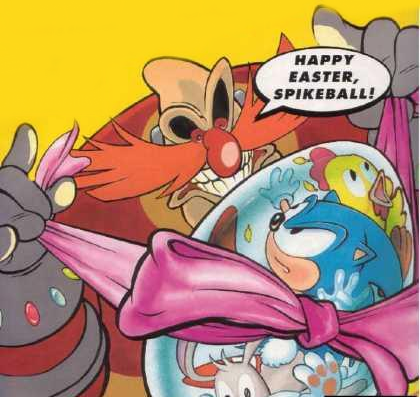 (I’m bolding for emphasis because I expect that to be asked a lot.) 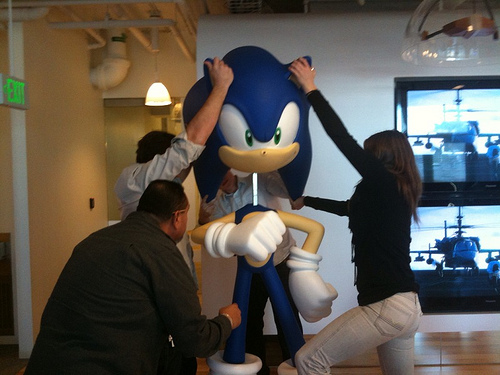 But rest assured, if he is ever in danger of meeting the inside of a dumpster, the community team will rescue him and give him a good home. 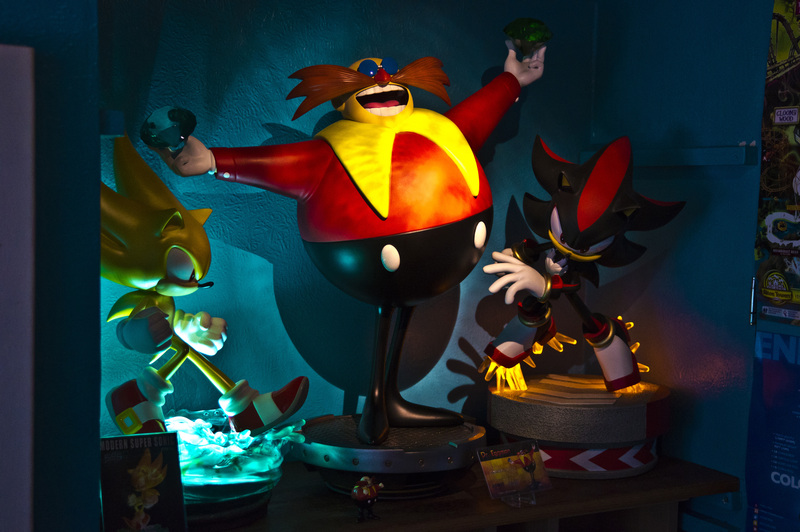 Check out the gallery of the new and old statues below. 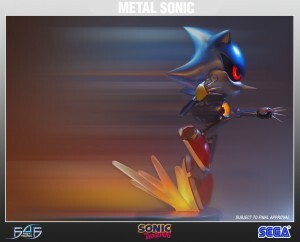 A little late, I know, but nevertheless, cool. 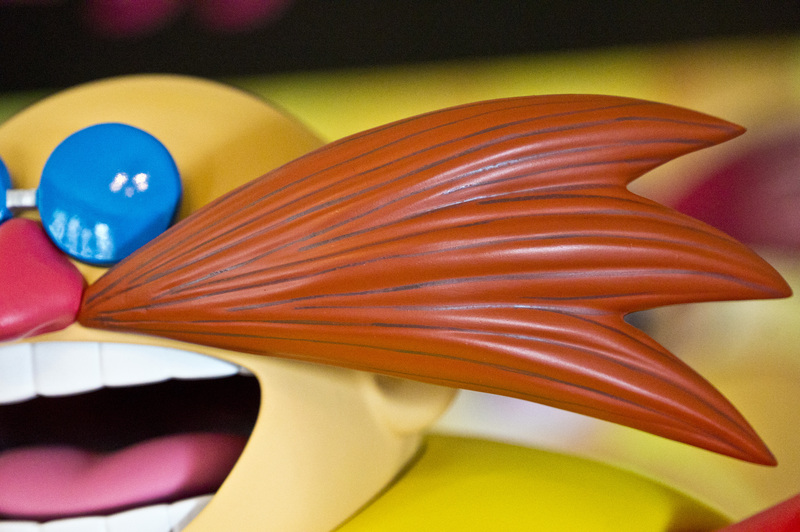 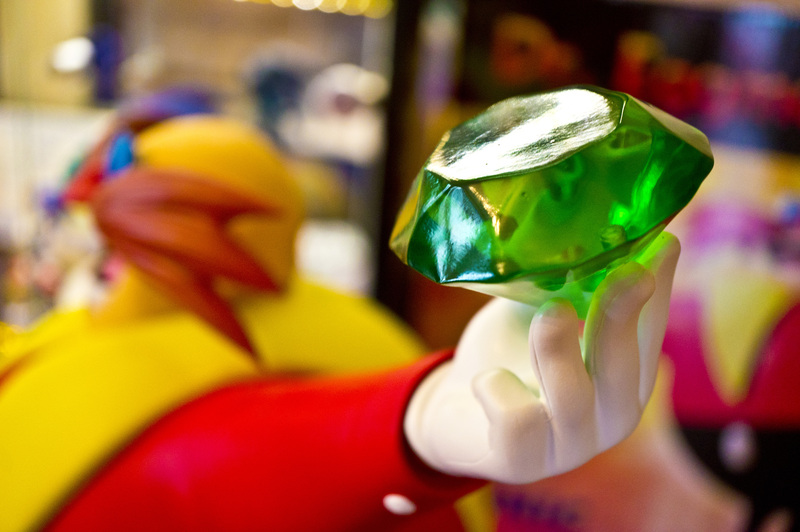 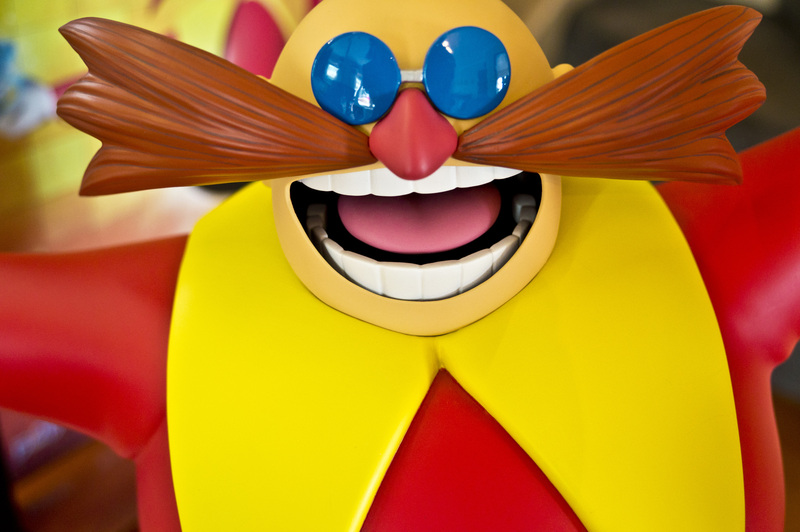 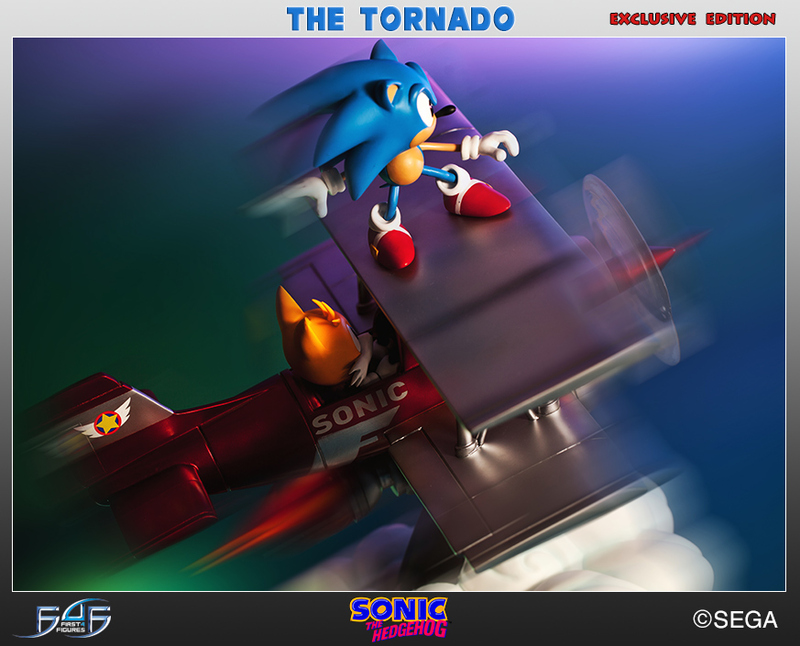 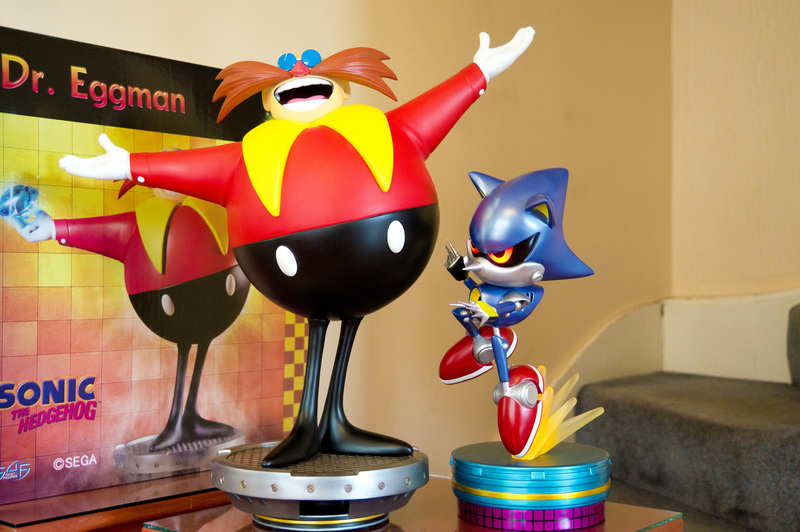 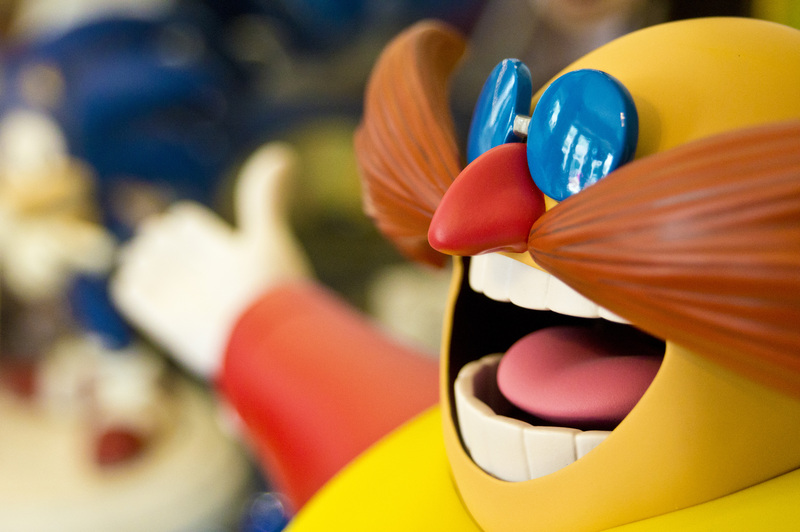 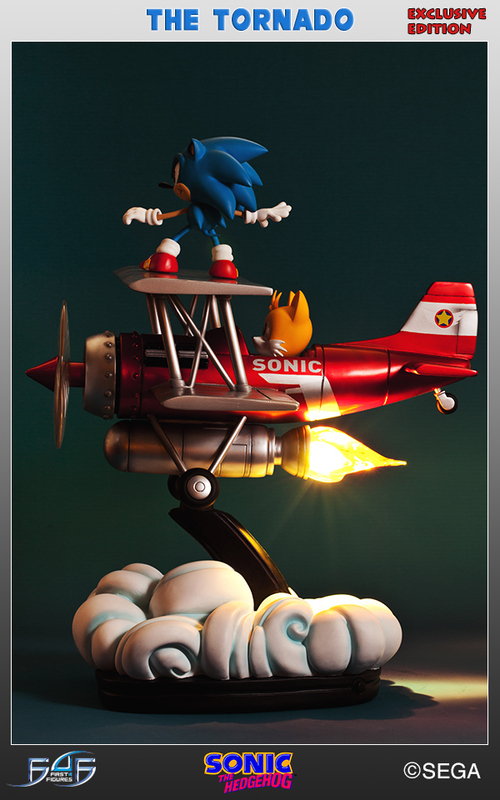 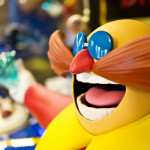 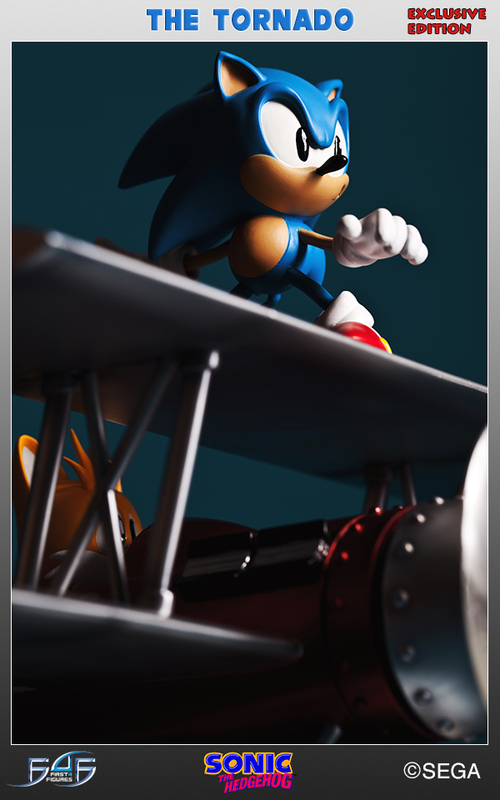 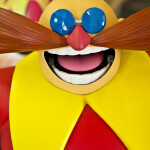 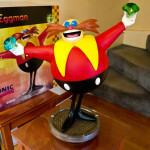 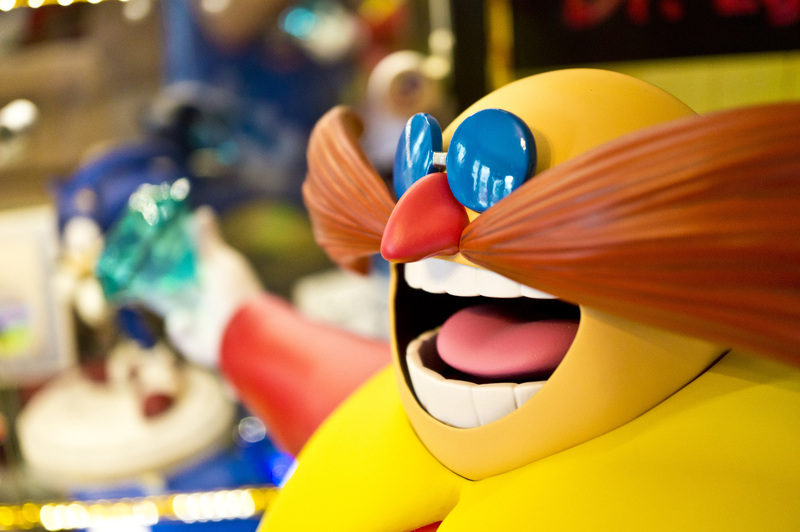 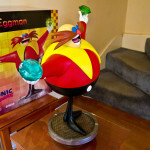 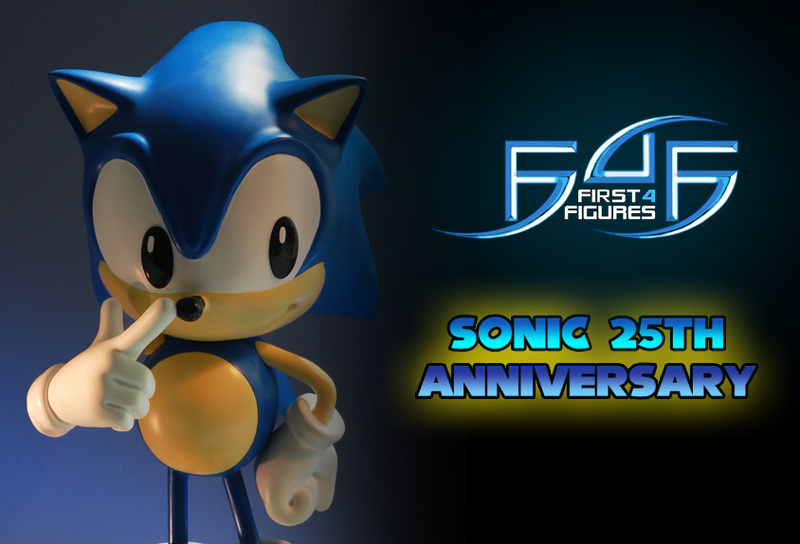 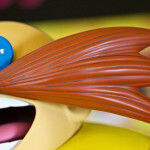 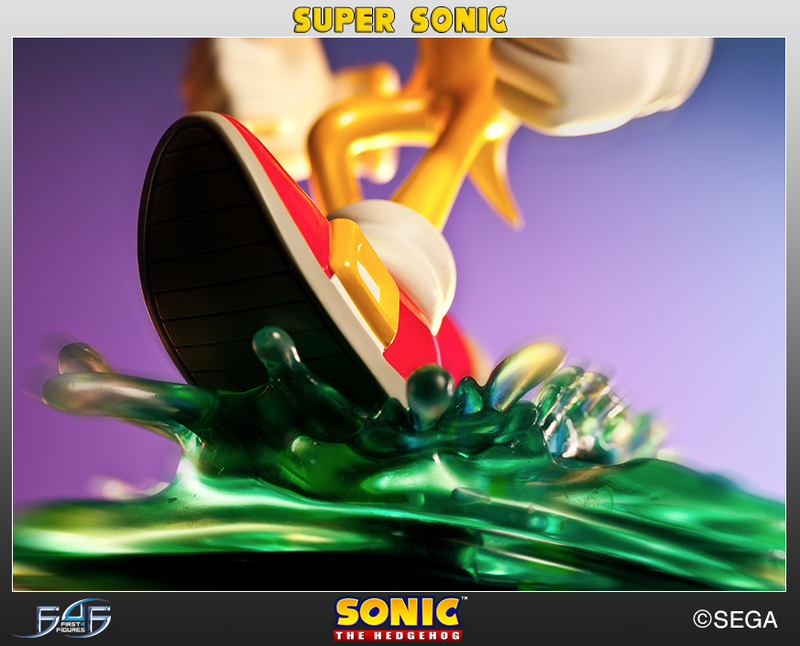 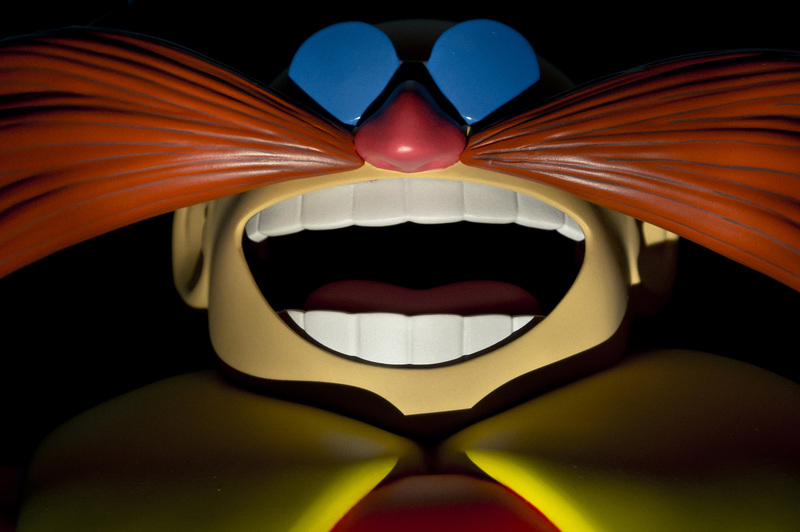 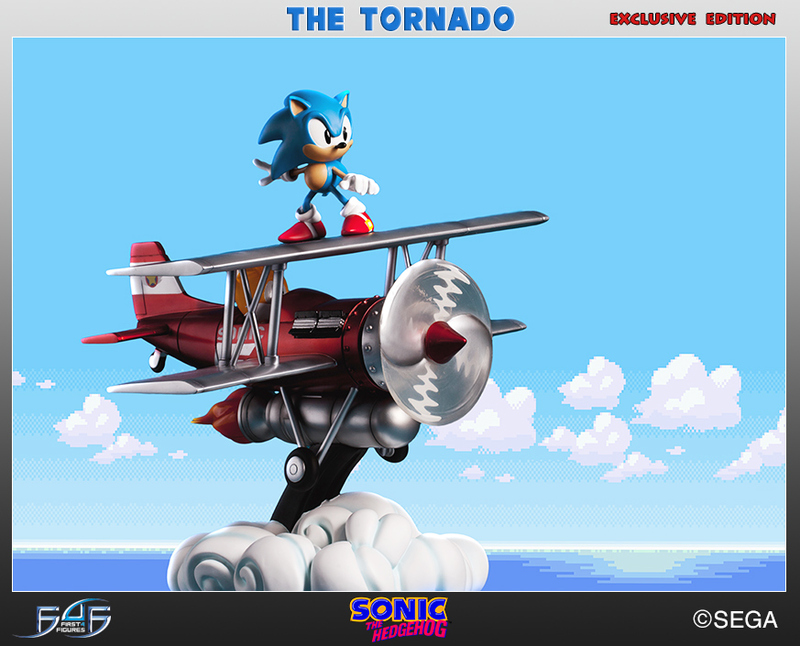 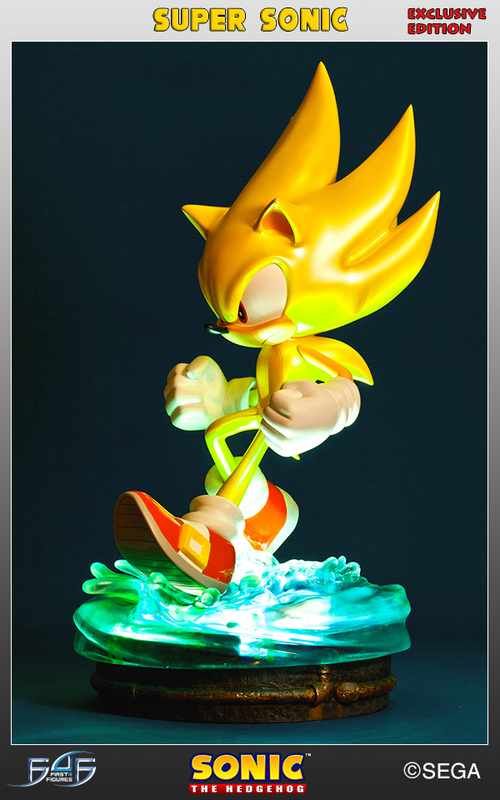 Remember those classically styled Sonic statues announced by collectibles maker First4Figures months ago? 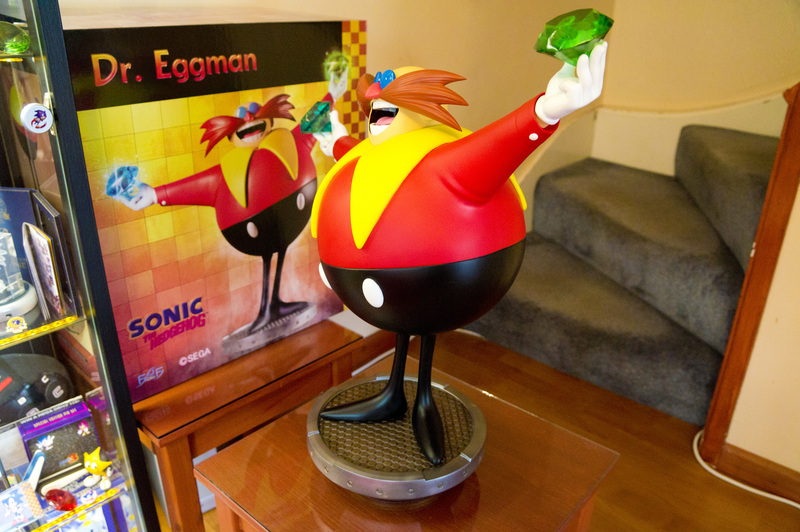 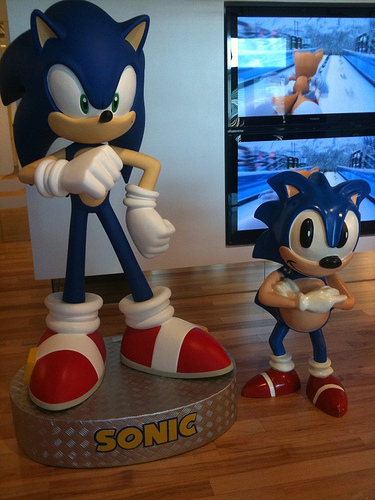 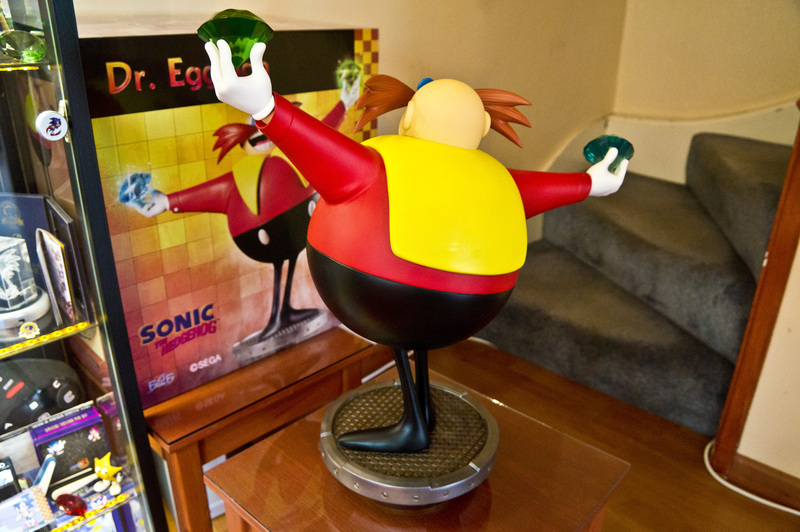 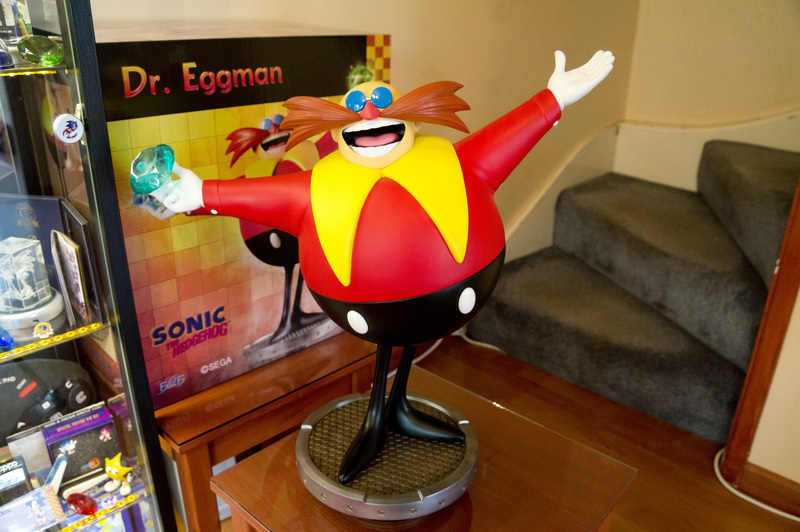 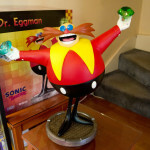 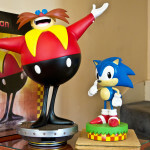 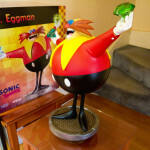 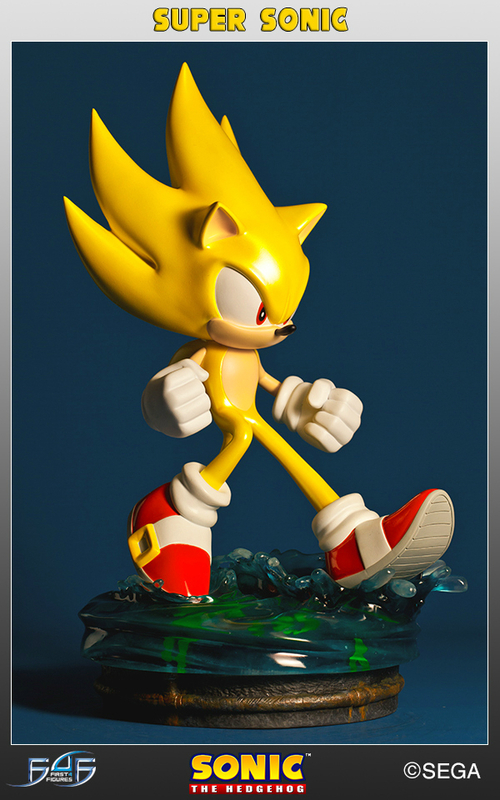 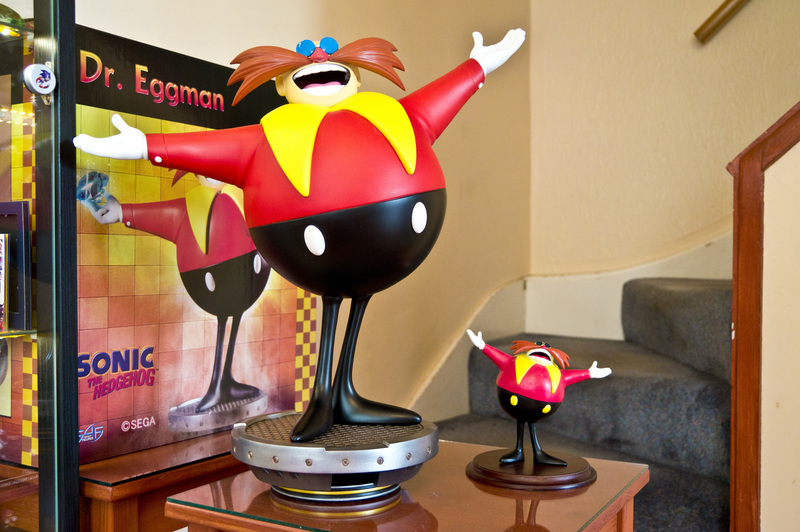 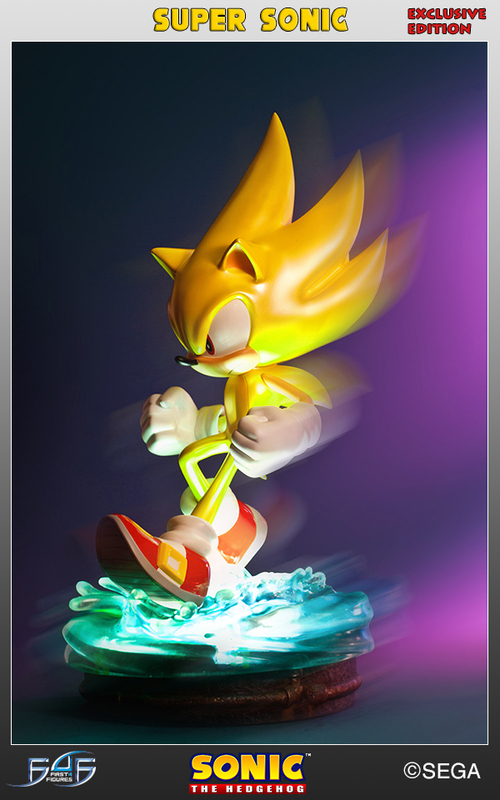 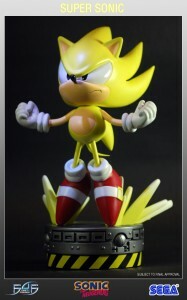 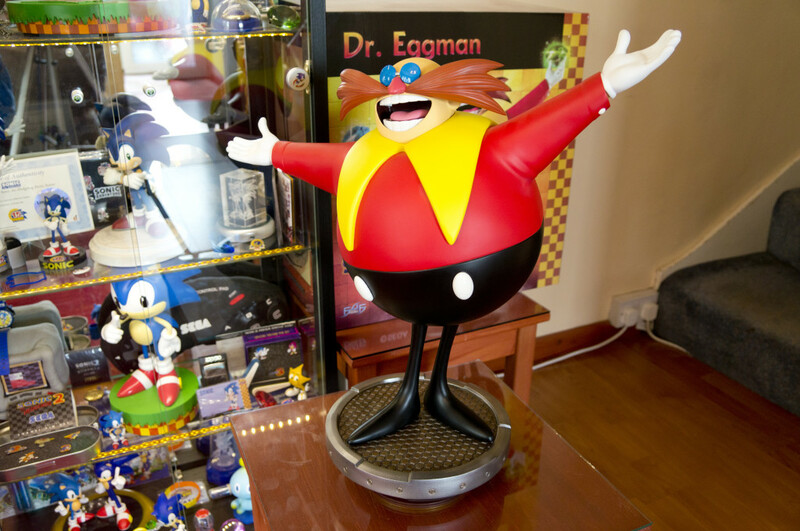 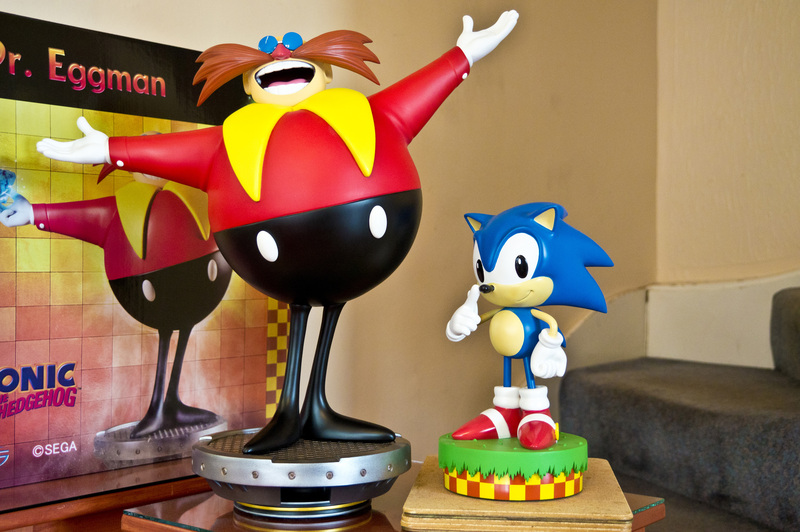 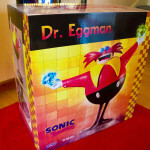 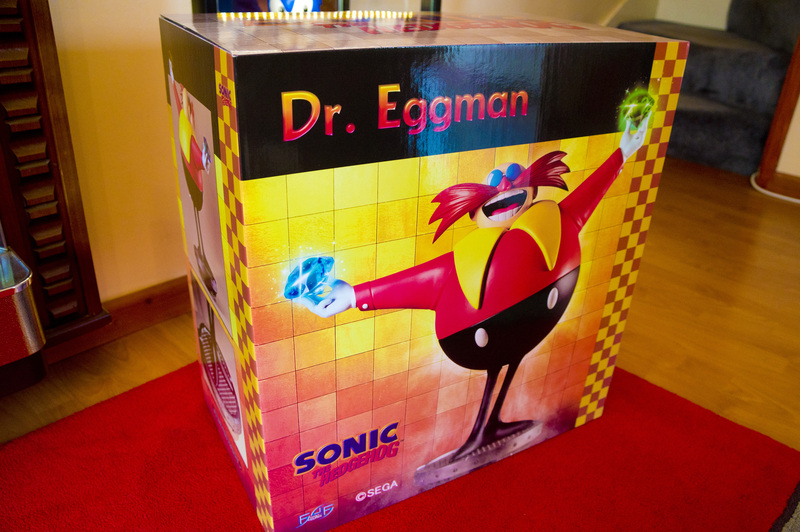 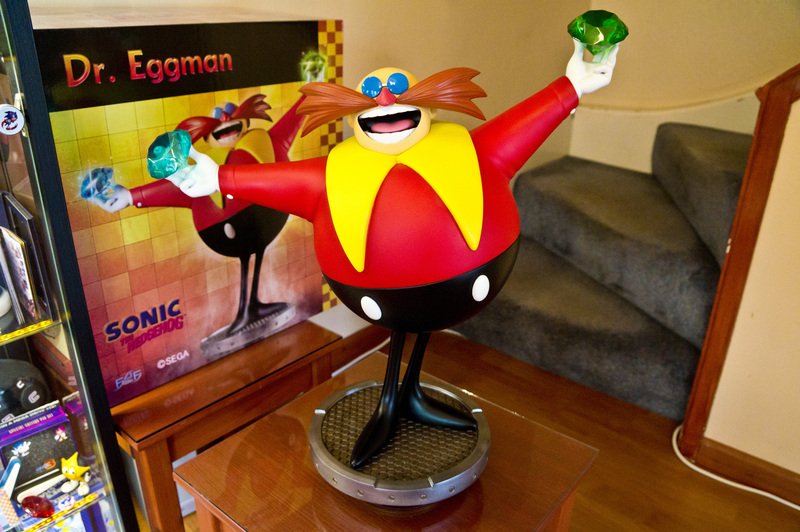 Well, they’ve decided to bring you even more classic Sonic goodness to decorate your desk with: a foot tall Sonic statue. 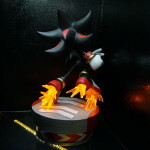 Looks cool, right? 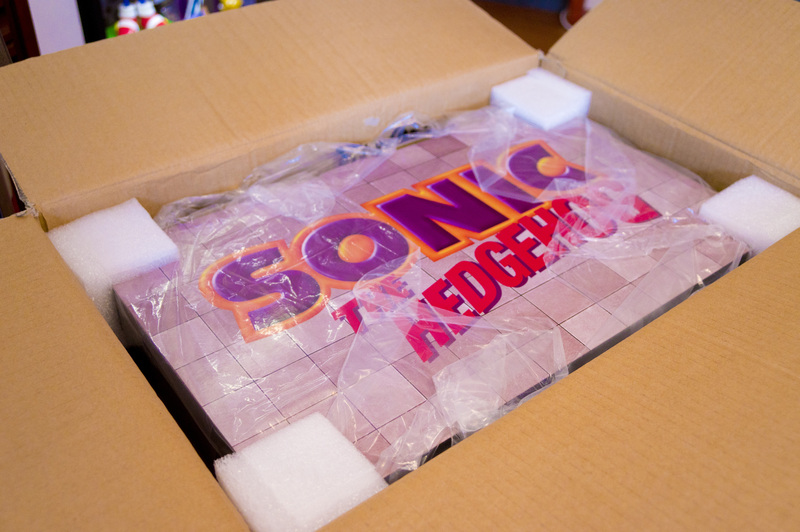 You probably want it, right? 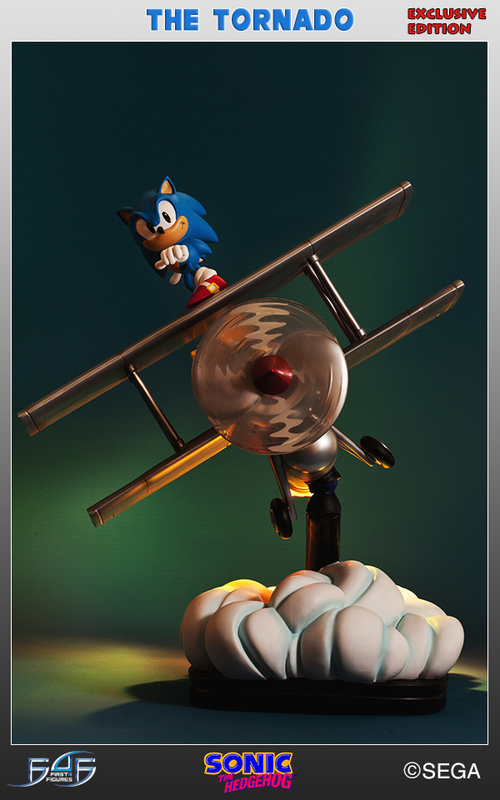 Tough, as this awesome piece of fine art comes with a $99 price tag. 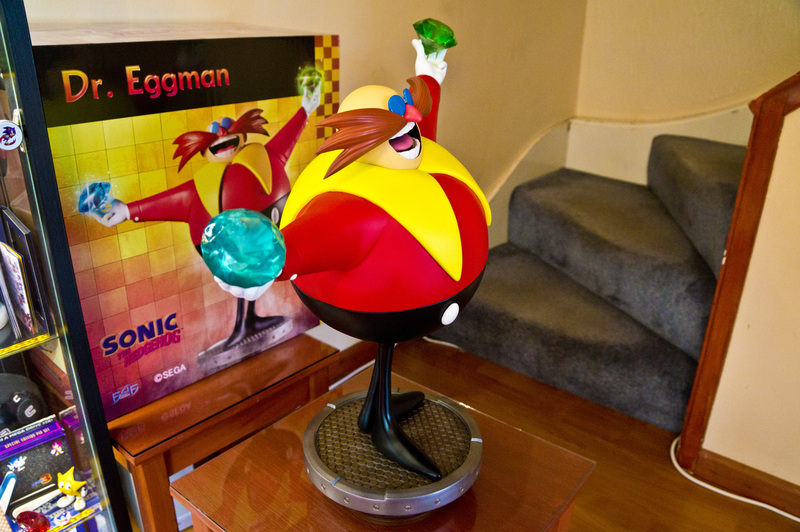 Given First4Figure’s reputation of fine craftmanship, however, I have no doubt that this is completely worth it…for those who can afford it.